THE NHS offers a range of interesting job opportunities for young people and not all of them require a degree. Two of our staff members – Nathan Westbury and Rebecca Harrison – began their careers at City Hospital and received training on the job without having to complete a degree to secure a post. Both became scientists after undertaking training at the hospital and now work in the laboratories on a daily basis. 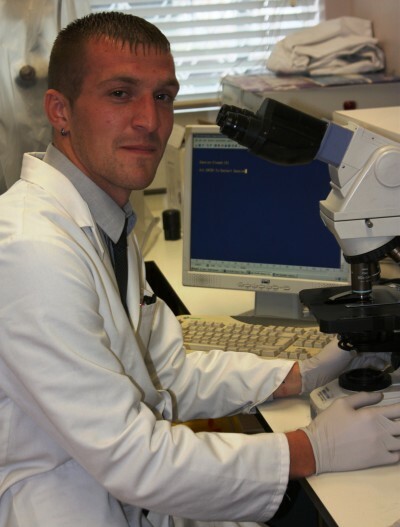 Nathan is a biomedical scientist in City’s Haematology Department, and joined the Trust in 2003 under a healthcare apprenticeship scheme. He works in a lab testing routine blood samples for diseases ranging from leukaemia to glandular fever, sometimes working shifts. “I left school at 16 and joined the apprenticeship, so I worked in the labs straight away and went to college part time to do A-levels in human biology and chemistry,” he explained. He already had an interest in biology and had planned to go on to college to undertake further study but saw an advert for the apprenticeship in the newspaper and decided it suited him better. “I was going to go to college and study human biology subjects anyway, but I thought this looked better because it would give me some real experience. I did my A-levels part time and at the same time I did an NVQ in clinical laboratory support,” he added. Nathan was then given the opportunity to study for a degree at the University of Wolverhampton. Rebecca is a radiopharmaceutical technologist working in labs to make up radioactive kits to help identify diseases. Like Nathan, she responded to an advert and undertook a cadetship that guaranteed some lab experience at the hospital. Rebecca enjoyed her work and later went on to complete a technician’s course. “I signed up to a two-year course, which included one day a week at college and four days working and I studied for a BTEC in pharmaceutical sciences,” she added.